… my husband’s would be in the Super Bowl. I guess that’s the best way to sum up what we have learned the past four weeks about Capable Dad’s amazing superpower. His body works harder than the average person at trying to heal itself. His body forms scar tissue at an incredibly fast pace. Now, this sounds like a great problem, right? In many cases, it probably would be. But when it comes to CD’s recovery from shoulder surgery, the goal is to break through the scar tissue as it forms so he can regain movement in his arm. Even a team of physical therapists, a very strong doctor, and a big stretching apparatus haven’t been powerful enough to conquer his scar tissue. Capable Dad went in for his 10-week follow-up visit on Tuesday. It seems that each of his follow-up visits is a little more discouraging than the one before. At this one, we learned that he is part of a very small percentage of people who build up scar tissue thicker and faster than most. As a result, he has one motion that — even after faithfully stretching and pulling his arm three times a day and even after going to 2.5 hour PT sessions four times a week — is not coming back. The doctor gave him three more cortisone shots and a warning that if he can’t regain his motion in four weeks, he will need a second surgery to go back in and cut out the scar tissue. We are closing in on the three-month mark since surgery day. Once he gets to the fourth month, the doctor says patients aren’t able to regain any more movement. At that point, the scar tissue has won. It forms a bond that is as strong as bone. I know that God can intervene and help CD rip right through the blanket of scar tissue that is encapsulating the back of his shoulder. I know that the doctor said this big, white, $2,000 contraption that CD straps on his body three times a day has had amazing results in other patients. I know that the cortisone shots could help. I know the physical therapists can try new torture treatments. I KNOW it’s possible to avoid a second surgery. And we’re praying like crazy that will happen. But for about 12 hours, I felt like I was suffocating. It was the first time I felt hopeless about the situation. It was the first time I allowed myself to even consider he might not fully regain the motion he once had. My mind started racing back through the sequence of events. 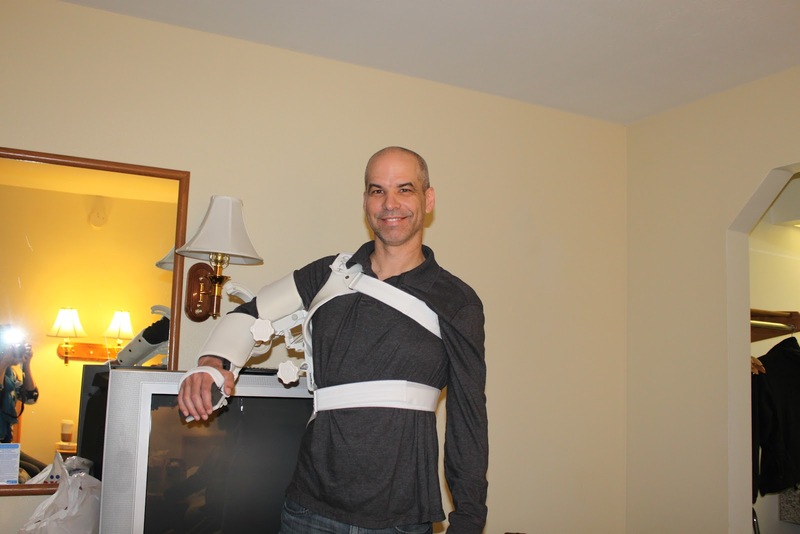 There was the initial surgery when the doctor said he was shocked to see how much scar tissue was already formed around my husband’s shoulder, basically creating a “frozen shoulder.” At the next visit, the doctor showed us the photos from inside my husband’s arm. He explained how he “aggressively” scraped out scar tissue, filed away the bone and “released the capsule” that surrounds his shoulder. At the last visit, the doctor wasn’t happy about CD’s limited range of motion when it comes to pushing his arm downward. While he is doing great with lifting his arm up and backward, he hasn’t been able to push it all the way down. Imagine the motion you make when you throw a ball. It’s the follow-through motion at the end that he can’t complete. Four weeks ago, the doctor increased his therapy sessions from three a week to four. He also prescribed the big white contraption in the photo that we lovingly refer to as a modern-day version of “the rack.” He slowly turns the cranks on the device to stretch his tendons and then hold them in that position for 30 minutes at a time. During therapy, two and sometimes three therapists work together to try to push his arm down. One holds his shoulder in place to keep it from dislocating while the other two basically lay on his arm to try to push it to the table. It won’t move. I think our whole family has accepted the “inconvenience” of Capable Dad’s inability to use his right arm. It’s been good for the kids to take on the duties of mowing the lawn, carrying out garbage and helping with lots of other chores. My husband would tell you that even his pain tolerance is so high now that what seemed unbearable a few months ago has now become an acceptable level of discomfort. It’s become more personal for me. I long for him to be able to help our son work on his pitching skills. I am suddenly desperate to go on one of our family bike rides. I can’t wait for him to be able to sweep up the toddler with both arms and spin her around in a big bear hug. The doctor says a second surgery won’t be a major set back if it comes to that. He will resume therapy the same day and restart the race to regain movement before the scar tissue forms. But for me, it seems like we would be starting over. And that is not something my mind is ready to accept. So, that’s the news. Thanks again for reading these updates. We truly appreciate everyone who has asked us how it’s going. Thank you so much for your thoughts and prayers! BLESS YOUR HEARTS!!! Praying for God to not only work in his shoulder, but for Him to lift you high above the anxiety!